Walk just a few feet inside the Long Beach Public Library’s Main Branch on a typical afternoon, and you’ll find a person at nearly every computer terminal — watching videos, sending emails, monitoring their social media accounts, playing games, shopping and browsing the library’s card catalog. Several folks take off their shoes and spread out their belongings, planning to stay awhile. They are as comfortable here as they are in their own living rooms. And that’s the point. 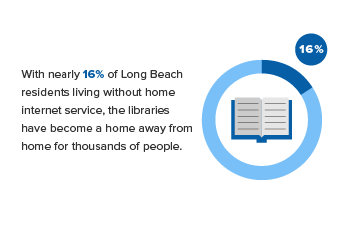 With nearly 16 percent of Long Beach residents living without residential internet service, the branch libraries have become a home away from home for thousands of people. The Main Branch is less overcrowded than most, making it a better experience. At other branches, where terminals are scarcer, there are waiting lists and strict time limits for computer use. “I’m here every day the library is open,” Ronda D’Antignac, 52, said while seated at a Main Branch computer, where she likes to watch soap operas and write poetry. She said she’d like to have access at her house, but the cost is too high. So, depending on the time of day, D’Antignac visits different library branches to avoid crowds. There are a total of 266 public general-use computers and 26 card-catalog computers at Long Beach’s 12 branches, with an estimated 21,000 computer sessions logged each month system-wide, said Library Services Director Glenda Williams, who has worked within the LBPL system for more than three decades. The busiest days are Tuesdays, with an average of 1,073 computer logins per day, or about 153 logins per hour. 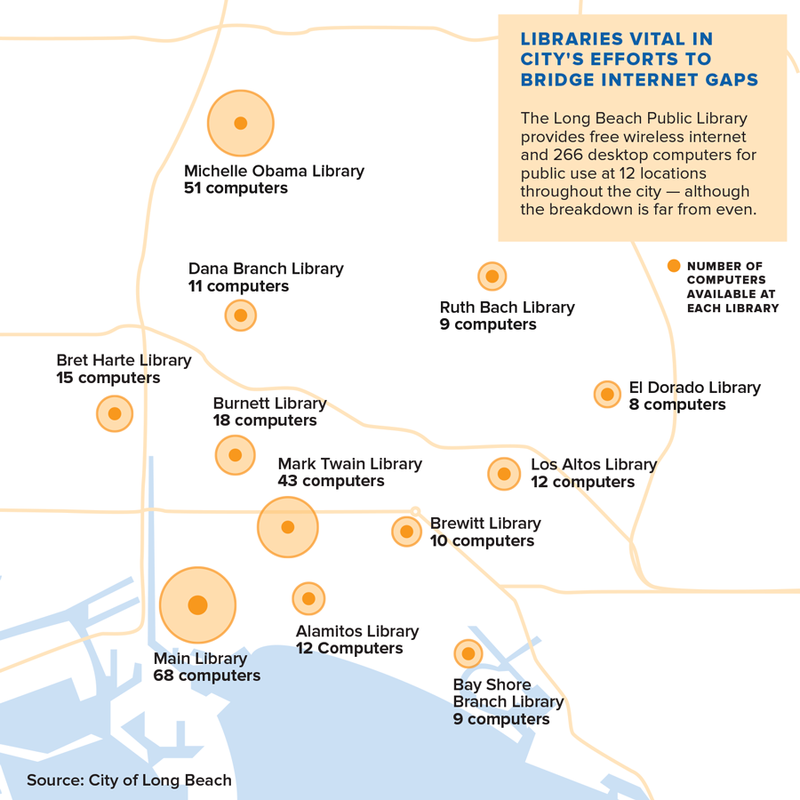 Long Beach’s library system is, at the moment, the city’s greatest asset in bridging the gap between residents who have easy access to computers and the internet those who do not. Librarians, for their part, have embraced that role, Williams said. Libraries are about literacy, she said. Not just reading and writing, but computer literacy, as well. Among the more than 284,000 library cardholders who could account for as many as 1.3 million total checkouts this year, many regulars frequenting local libraries don’t come for the books. They come, Williams said, because they cannot afford internet access at home. In fact, Long Beach library checkouts have declined by about 14 percent since 2010 — from about 1.5 million to to less than 1.3 million checkouts last year. At the same time, librarians are quick to point out, cardholder numbers have increased by 11 percent during that same time period — from 253,880 to the current 284,539 cardholders. This is due, in part, to the banks of computers that have nudged out some of the old bookshelves. One such cardholder, Cal State Long Beach student Julie Lopez, 20, gets her homework done at the library at least twice a week, enjoying the savings of not paying for internet at home. She brings her laptop, notebooks and backpack and said it’s a quiet place for her to study, research and turn in assignments. The library services director, too, said she wishes there was a budget for every library to be open seven days a week and for longer hours. Currently, branches are open from noon to 7 p.m. Tuesdays and Thursdays (the one exception being the Main Branch, which is open until 8 p.m. Tuesdays); noon to 6 p.m. Wednesdays; 10 a.m. to 5 p.m. Fridays and Saturdays; and four neighborhood branches (Bay Shore, Burnett, El Dorado and Michelle Obama) are open from noon to 4 p.m. Sundays. All libraries are closed Mondays. Williams said the library system’s services budget has remained basically the same since 2009, when it was $12,418,161, compared to the 2018 projected budget of $13,316,763. The lowest the library’s budget has been during that same time period was in 2011 at $11,710,527. Always trying to spend money in ways that maximize the public good, Williams said libraries — just like any other city department — could always use use more funding. If she had her way, Williams said, the city’s libraries would be open every day for longer hours, there would be improvements made to branches that need retrofitted infrastructure, and the system would have faster internet service and additional computers. It was only a few years ago, she said, that the Alamitos Branch, which is one of the oldest, had only one electrical outlet in the entire building. That’s since been remedied. Branches located near schools are usually teeming with youngsters in the afternoon, especially Burnett, Mark Twain and Michelle Obama, but also the Dana Branch. Students using computers at those branches sometimes report wait times of 15 minutes or more for a computer. When there’s no one in line, librarians often will let people stay longer than the two-hour usage limit, but there’s a strict adherence to the rules when it’s crowded. In terms of internet speed, Williams said Long Beach has a “spoke and wheel” system where each branch connects to the Main Branch. There is a 1G connection for each branch, and Williams said the speed is tested regularly and has proven to be “sufficient” to meet current demands. Still, she said, it could be faster. For now anyway, there’s wi-fi access at every branch, and digital-savvy library workers Richard Chavando and Gabriel Gaete report that the internet speed has not been a problem. Chavando and Gaete provide assistance to patrons in the Main Branch’s technology-based makerspace called “The Studio.” They also take a mobile version of The Studio to other branches and city events. 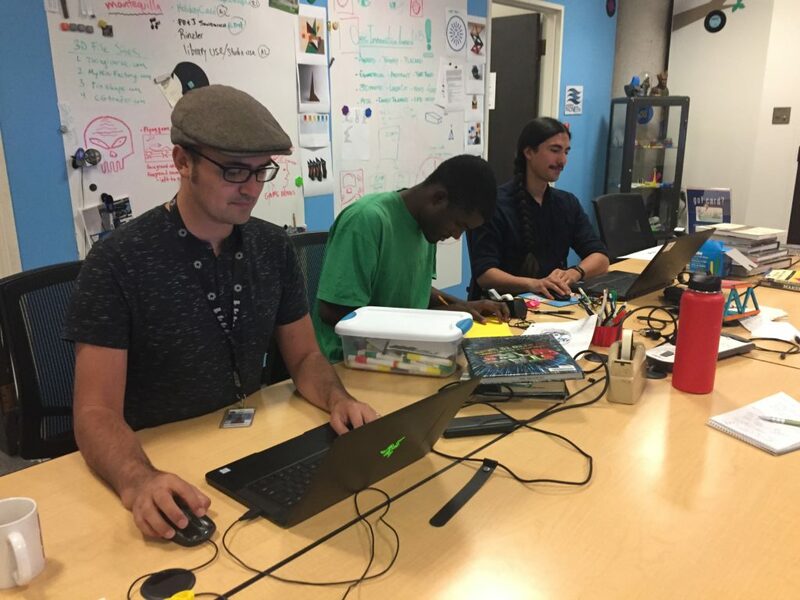 As The Studio guides, Chavando, 26, and Gaete, 36, are there to help students with school projects, give seniors basic support on mobile devices, teach coding workshops and foster a welcoming environment for anyone to gain digital literacy. The services and supplies they provide are offered free of charge. Chavando, who recently helped a 9-year-old boy construct a science project that has been entered into a national competition, said there have been many feel-good moments at The Studio since it opened in 2014. Among those who have sought assistance from the guides is 60-year-old Alton Obey, a homeless illustrator and self-described “starving artist” who needed to learn how to turn his pencil drawings into digital images. Obey plans to publish a comic book. “I’m an older cat, so this isn’t easy for me, but the guys downstairs (at The Studio) are so helpful if you need anything,” said Obey, who brings his computer to the library almost every day. He sits at one of his favorite tables, with headphones on, working on his drawings, studying comic books and making plans to publish his finished work. “They helped me upload Photoshop, and they taught me how to use it,” he said, showing off some of the colorful pages he’s put together for his book. Obey said he depends on the library services provided downtown, and he is looking forward to the construction of a new Main Branch, set for completion in the summer of 2019. Williams agreed that construction of a new Main Branch is a good thing, allowing for overdue modernizations. She said the number of computers is expected to increase slightly in the new building, and The Studio is also going to expand. In the meantime, construction zones surrounding the circa-1976 Main Branch have hurt visitorship, as many patrons mistakenly believe the library is closed, Williams said. The silver lining, she hopes, is that attendance will boom when it’s complete, similar to the way it did following the opening of the Michelle Obama Branch. Visits at Michelle Obama are up 70 percent, totaling about 16,400 people each month, compared to the old North Branch. Besides improving its physical infrastructure, Williams said the library system is doing everything possible to reach beyond its walls and serve people who don’t want to or aren’t able to physically visit the branches. Books, still organized by the Dewey Decimal System, are online now in a digital card catalog that library patrons can access from any computer or mobile device. The library’s website is interactive with email alerts and due-date reminders, with a steady flow of traffic, even in the middle of the night, Williams said. LBPL’s countless book clubs, educational workshops and other services for physical visitors are enhanced by a whole world of online resources, including Career Online High School, Brainfuse Job Now (which includes free resume review), Brainfuse Help Now (live online homework help from tutors) and other programs for learning business skills, researching ancestry, learning languages and more, including electronic book and film checkouts, for anyone with a library card to access from home. “Even if people never walk into the library, that’s okay as long as we’re meeting their needs,” Williams said. 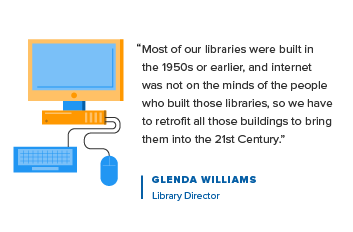 The biggest challenge the library faces in the fight against the digital divide, Williams said, is awareness, and she said the library has to do a better job of marketing itself to a community where an estimated one-in-six households do not have internet subscriptions at home. She emphasized that the library’s main purpose is to help people, starting with traditional literacy but expanding beyond that to help meet individuals’ educational and personal goals. “I love technology and I love change and I love having new ways to connect with the community. I love that,” Williams said.